The small American town of First Blood makes a critical mistake: insulating itself from the realities of Vietnam. 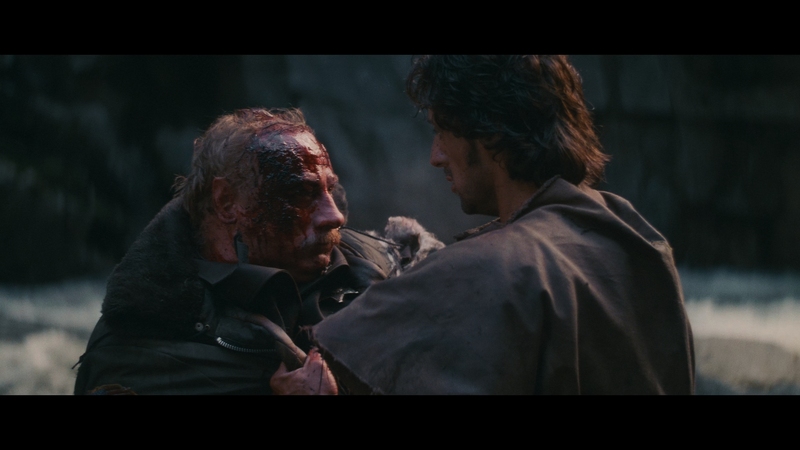 Veteran John Rambo crosses the town border, but is forced out when a local sheriff considers him a vagrant. Our soldiers lost the war. There’s no chance this town will accept that truth. First Blood covers the anxiety of losing a war. It’s an unfamiliar feeling in a country primed by militaristic exceptionalism. Rambo (Sylvester Stallone) is the victim of that ideal; the police serve as a totalitarian military, keeping people safe from “outsiders.” When the defiant lone soldier doesn’t follow orders, sheriff Brian Dennehy doesn’t stop – he starts a war. He sends troopers into losing conditions without the sense to admit defeat. Vietnam’s realities impact the town in a most direct way. As a piece of post-Vietnam cinema, First Blood deals with the adverse effects of PTSD, honest in a sense, if extreme for the sake of action. First Blood’s greatest attribute is taking a monster movie formula and giving it legitimacy. Rambo (the monster) hides in wait for his prey, setting traps and wrecking the town while local officials fail in defeating the beast. Predator took the formula, even the Vietnam theme, and made the same movie five years later, albeit with more muscle. To note, First Blood poses an imperfect thesis. As much as the movie adaptation of David Morrell’s novel winds through a story of post-war effects, it’s a super soldier’s story. That’s encapsulated by what the Rambo sequels and cartoon spin-offs became. Much as Rambo suffers and endures a gut-wrenching emotional breakdown, he’s also a macho, masculine Green Beret. He withstood torture, knows survivalist techniques, and fights against those on a government payroll. 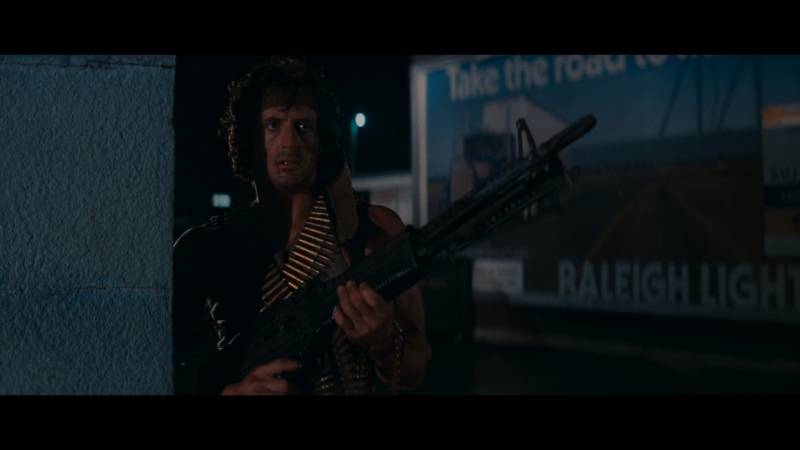 By the end, Rambo hoists up a four foot machine gun, wraps himself in a bullet belt, and begins setting off explosions. It’s Hollywood excitement, butting against the previously somber, desperate tone established earlier. 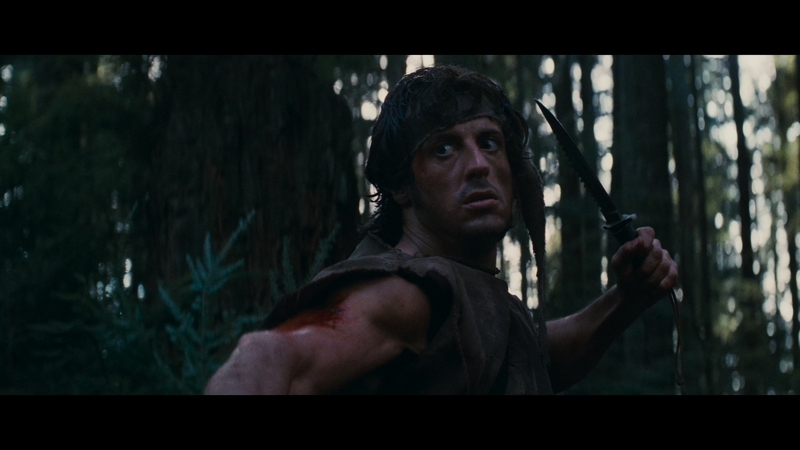 Picture the character of Rambo, and it’s an image of these final scenes, not those in which he’s beaten by police or fending for himself in a forest. That last act’s boisterous gunplay is a mistake, corrupting the idea of what PTSD is, or simply selling the thrill of watching bullets shatter glass. First Blood, like Apocalypse Now, wants to teardown Vietnam. In Rambo’s case, it’s through the eyes of a single soldier, seeking any connection to his homeland. With Jerry Goldsmith’s somber horned score, First Blood becomes a morose reflection on the mental drain of warfare, not a fixation on gore or success. In that, it’s a unique exploration of what happens when a country addicts itself to combat. The ending then, that’s what happens when western audiences need their fix. Lionsgate debuts First Blood on UHD with a new 4K master. The initial impressions stand out. 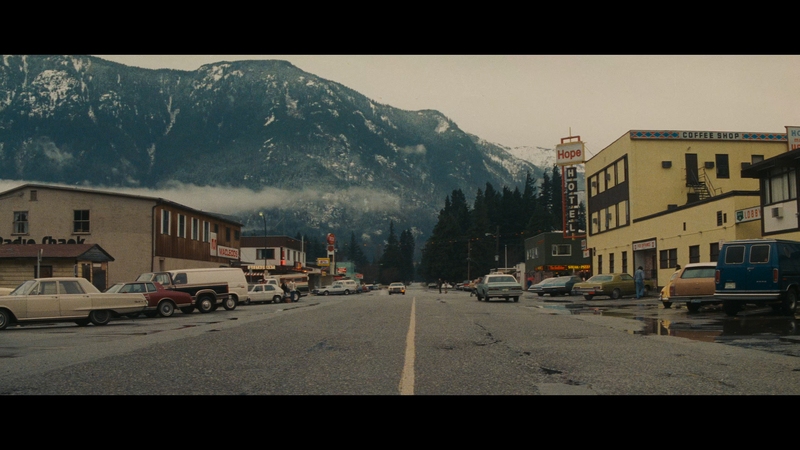 With a pinprick-like grain structure, the resolution as Rambo walks down the hill is substantial. The texture of wooden barns, Rambo’s uniform, the grass, and the water all display exquisite definition. Forest scenes do too. Rock faces and moss cover much of the screen with textural qualities. All of the trees show intense sharpness. If something goes wrong, it’s with the encode and only slightly. Some scenes buzz with light artifacting, enough to swipe detail from the screen. Early shots of Dennehy speaking to Rambo from the car appear digitally fuzzy, not just from the source. Inside the police station, solid colored walls cause issues. 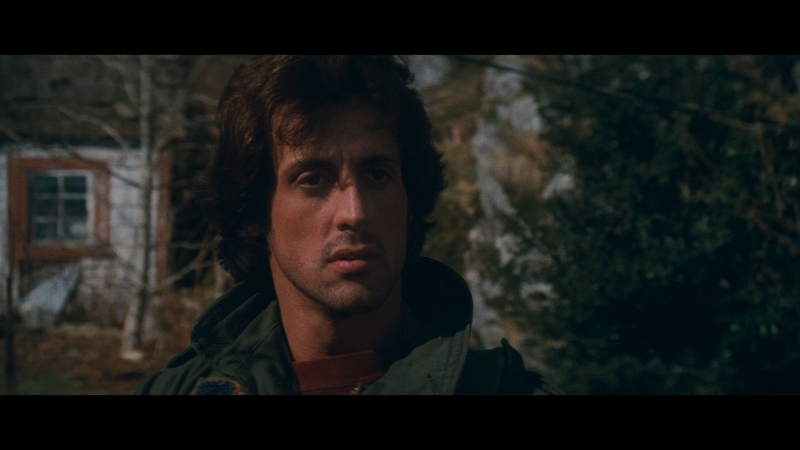 Oddly, First Blood holds up fine when amid more complex scenery. Suitably aged, the color palette exhibits peak density. All of the greens in the forest look splendid. Police cars show a dominant blue, with their lights equally rich. Flesh tones maintain consistency. Complaints then will concern the HDR pass, or rather the apparent lack of one. Rarely, if ever, does First Blood utilize expanded range. In terms of depth, there’s little to go around. Black levels never reach black, instead hovering around a murky gray. That’s outright awful when Rambo waits inside the mine. And highlights barely flutter. Although explosions manage to peak, the rest minimizes intensity. As Rambo rampages through town at night, all of the signage and storefronts die out with minimal brightness. 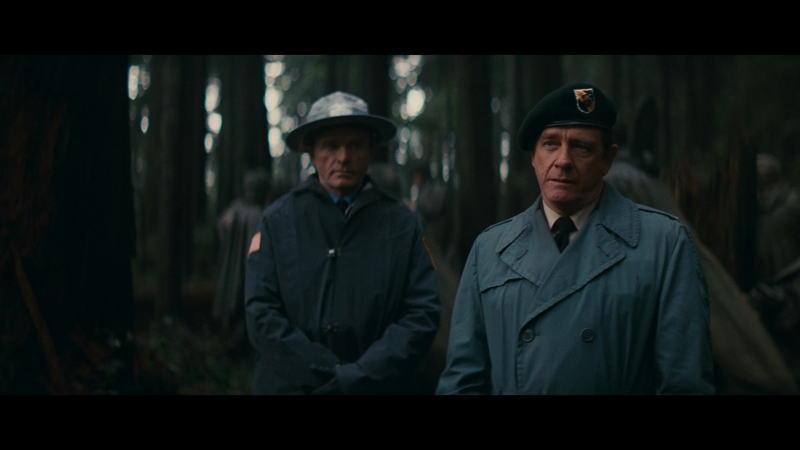 It’s not only that First Blood lacks HDR-level contrast so much as it lacks much contrast at all. Muddy and murky is fine to an extent. This goes a tier beyond. Originally released in a Dolby stereo four-channel mix, the choice here is DTS-HD 5.1. It’s excessive. Most of the surround effects, especially the bullets traveling through the soundstage, sound wholly artificial. Their tinny nature is only exaggerated when pushed through more channels. Cars and helicopters do maneuver between speakers naturally however. Goldsmith’s score lacks dynamics and flutters a bit at its treble-filled peak. Low-end support is cleaner and richer. The latter does not go for the action. Explosions rumble, but do so with a loose, strained effect. It’s an effect that sounds audibly fake and forced, out of place. The UHD contains two commentaries, one with Stallone, the other with author David Morrell. Everything else is on the Blu-ray, including a new featurette called Rambo Takes the ‘80s, a 17-minute retrospective that covers the origins of the project. Note this is part one. The other movies in the series hold the other pieces. A look at the restoration process arguably belongs more on the UHD as to show the expanded color, but it’s only on the Blu-ray. A dated making-of runs 22-minutes, fine if this is your first run through First Blood. An alternate ending and outtake follow, with two featurettes focused on real troops following. There’s a workout to get you into Rambo-shape that finishes things off. First Blood is a unique take on the American perspective on the Vietnam war, but does crumble its allegory in the last act.